J1772 Melted - How much will this cost to fix? So I went today to plug in at an L2 and found the plug would not fit in my car. Odd I thought. 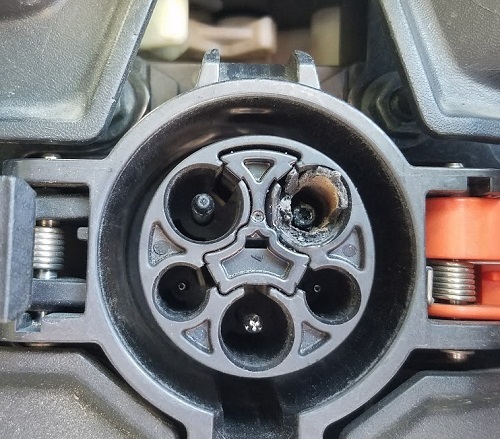 After inspecting both the EVSE plug and looking at the J1772 port in my car, I notice what appears to be the melted remains of part of the plug on the public charger I used last Friday. It looks like high heat degraded the plastic of the EVSE handle allowing it to snap off, and melted part of the J1772 plug in my car, bonding them together. I tried to pull out using a pair of needle nose pliers but no go. The car charged just fine using a CHAdeMO. Is this an easy fix, or something Nissan is going to charge an arm and leg for? Should I continue to try to worm it free using pliers? Re: J1772 Melted - How much will this cost to fix? Looks like you're screwed to me. Was it a Blink station? Those are known to have problems with charging above 3.8 KW. Contact Tony Williams at Quick Charge Power. He might be able to help. Who is Tony and what help can he offer? I took it to the dealer, they were really nice. They say there is no way to replace the melted plastic itself, you have to replace the entire reciever and harness. It is around 8 hours labor. Total price quoted a little over $2,100. Last edited by alozzy on Mon Jul 10, 2017 7:59 pm, edited 1 time in total. Mine is a 2015 S model with DCQC port so it looks like this is the right number. I'm waiting for the Nissan service manager to get back to me so I can check what part they thought I needed and compare. Last edited by DesertSprings on Mon Jul 10, 2017 4:11 pm, edited 1 time in total. Tony can sell just the ends, with a pig tail , so you do not have to change the harness. 2 hours not 6 if it is a 11 or 12. with the charger in the rear. Tony has the charger side so you can repair the EVES too. Nice guy call him, he will help. speedski97 wrote: Tony can sell just the ends, with a pig tail , so you do not have to change the harness. 2 hours not 6 if it is a 11 or 12. with the charger in the rear. Tony has the charger side so you can repair the EVES too. Nice guy call him, he will help. Reddy wrote: Looks like you're screwed to me. Was it a Blink station? Those are known to have problems with charging above 3.8 KW. Contact Tony Williams at Quick Charge Power. He might be able to help. Ok, I found Tony's Quck Charge Facebook page and will reach out to him. For the question about the charger, it is a Sema Connect charger. Looks like the locking mechanism on the handle is broken, so probably over time slowly slipped out while charging causing it to arc.